It’s been a few weeks now, and our four new rescued hens have settled into a routine. While they still lack many feathers, their new coop is warm and dry, and they are eating well to nourish the vigorous return of that fine plumage. Rescued hens are typically missing most of their feathers because they get bored living in small cages, doing nothing more than feeding in order to lay eggs, and peck themselves bare. Now that these hens are discovering a free-range world of earth scratching, worm hunting, dust baths, yard exploration, and pecking order establishment, there is simply no time to be bored. While discovering their new world, they walk over our feet or under Sam, and try to supervise our activities. All six of our chickens are friendly, curious, and happy to have the right to roam. I understand that happiness, too. English culture and literature is peppered with references to walking the countryside. Without Britain’s network of public footpaths, would Elizabeth Bennet have ever run into Mr. Darcy? Unlikely. For centuries, the principal means of getting around in the UK was on foot, and from people and livestock making their way to towns and markets emerged a spider web of footpaths, droving routes, and bridle paths, connecting villages and homes. They were in constant use and today form a part of our national heritage and walking tradition. In America, we lack ancestral footpaths and, unless living in a city, the idea of walking to the shops, let alone on a muddy path through the middle of a farmer’s field or a large landscaped estate, is unthinkable. “Surely, that’s what roads are all about.” my American mind occasionally thinks. The track leading up to our house serves as both a public footpath and our private drive. 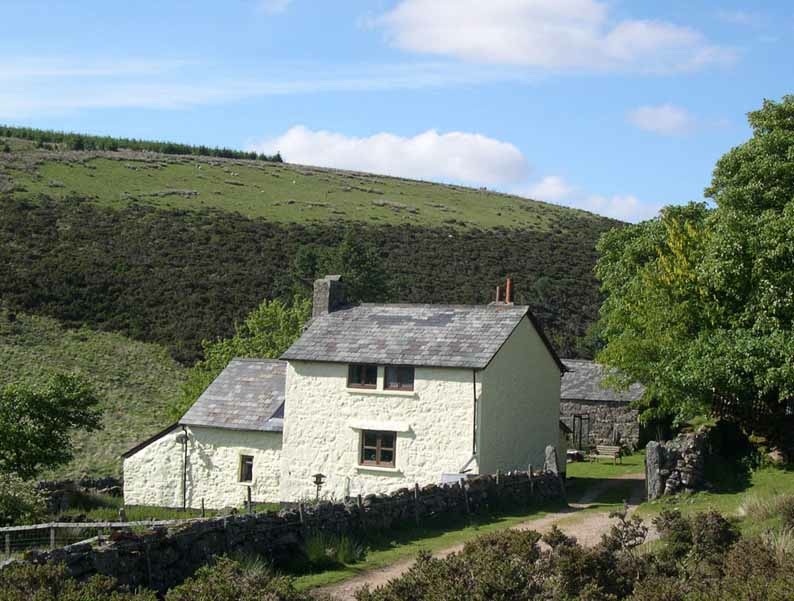 Every day, a number of walkers pass by the house, including the young and old, the serious hikers with maps, compasses and full packs or the more casual stroller wearing flip flops and jeans (not the way to walk on Dartmoor). We’ve had walkers stop to tell us of injured sheep, or to inquire about birds nesting in the area. Some walkers stop to take pictures of our house or the birds at the feeders. We’ve helped lost hikers, chatted with those taking a break near our wall, and marvelled at the stamina of more than a few photographers lugging their tripods, SLR cameras and giant lenses up to the tors. Because it is our private drive, we maintain it. When we first arrived at Crockern, the track was riddled with potholes and driving along it was what I imagined operating a lunar landing craft across the moon’s craters to be like. In early September, we had 40 tons of road planings delivered which filled the major potholes. Since then, we’ve been busy maintaining the track by watching where water flows during rainstorms and creating little channels to direct it away. The start of any new potholes are immediately filled and we have plans to order another 20 tons of planings in the spring to improve upon our initial repairs. We fear we may be bordering on track obsession. Available footpaths and the right to roam haven’t always been protected in the UK. By the 1840’s, much land was enclosed — “fenced off” — by private landowners, limiting the previous egalitarian access. A campaign for full rights of responsible access to all of Britain’s green and pleasant lands, started with the Kinder Scout demonstration on 24 April 1932, when five people (Ramblers) were arrested during an organized mass trespass designed to illustrate that the countryside should be for all to ramble, and not for the exclusive use by a few private landowners. In 2000, the Countryside Right of Way Act passed, granting people in Britain the freedom to roam in the open countryside. With the extensive network of trails and meandering paths today, it’s easy to map out a local walk or to chart a course from Land’s End to John O’ Groats. It’s different in the States. We may walk on trails that are marked, or off trails in the back-country of established Parks and Forests, but we can’t just cross-country it without encountering someone’s private land where to pass would be to trespass. Known for their intolerance of ramblers walking on legitimate rights of way on their estate in Wiltshire, Madonna and Guy Ritchie went to court against the Ramblers hoping to divert these long established footpaths running through their property. Unlike Madge, I’m not a material girl and recognize that the track toward our house is a public footpath leading onto common land where everyone enjoys the right to roam. Even in the depths of British wilderness, the Jehovah’s Witnesses manage to find you. Leaving these two to stand in the wind and rain, I offered a curt, “Thanks, but no thanks” and refused any literature. Using my best Mid-western charm, I steered possible conversation from faith systems, religious practices, or personal beliefs to a quick, “Now you folks take care.” and sent them on their way. In that moment, I imagined that our modern day Madonna might feel the same as I: Irritated by the unwelcome interruption. Taking a more evasive approach, Roger hid in the barn and watched the entire scene. We all know this to be a successful means to avoid cold call solicitations. Another is to post a deterrent sign: Our Dogs Are Fed on Jehovah’s Witnesses. Back in 2006, after having such a sign on her garden gate, an elderly woman was told by the police to remove it. While I stood at the sink, trying to get the coffee stain out of my shirt, I also contemplated this option. I’m not certain she would have done the following: Roger ran down the full length of the track after one man, as he drove off to suggest to the man he read the sign on the gate more closely. I once challenged a man who had parked up, blocking the gate into our yard, in order to put up signs for an organized walk. Had he asked, we would have happily let him park and go about his task. Alas, despite being about 100 metres from his car, with the engine off, he maintained that he wasn’t parked, lamely offering instead, “I looked to see if anyone was home first.” With our cars parked in the yard and a light on in the house, I offered my retort, “Yes, but you still drove up the track to see if anyone was home.” I should know better: with drunks, the dim-witted, or the down right obstinate, there is no logic or reason that matters. We’re not ogres about the track, but at just under a half mile long, it is a lot to maintain and a wheelbarrow full of road planings is heavy. Natural England, who regularly monitor Wistman’s Woods, send us e-mails confirming their arrival and asking if it will be okay to park near our house. We always say yes. Dartmoor Rescue needn’t ask permission, as they have people to save. The farmer, whose sheep and cattle graze around us, always calls first to be certain we aren’t inconvenienced when they are gathering their livestock. Sadly, it hasn’t taken us long to develop an intolerance for these unannounced drivers. The day I saw a car speeding up the track, road planings spinning from under car tires, I was ready. As the two men emerged from the car offering some mumbo jumbo by way of an introduction, copies of Awake! and Watchtower held aloft, I didn’t offer my usual “Thanks, but no thanks.” I opted instead for an icy tone, “If you hope to share ‘The Truth’, at least behave like real pilgrims and walk up the track.” Feeling certain this was closer to something Madonna might herself utter, I privately enjoyed my wit and noticed it was not met with the loving kindness one expects from servants of the church. Today the sun is shining, the wind is crisp and in anticipation of the holidays, Roger, Sam and I will leave the chickens to freely roam the yard while we don our winter weather gear and waterproof footwear and set out for a long and meandering walk across the countryside. If I’m reading the map correctly, there’s a pub midway where we can stop and have a refreshing rest along the way and perhaps come up with some persuasive language to post on our gate.